Charlotte Mrani is the social worker who decided to go all in on her passion for creating fine, handmade boxes. Today, she is a craftswoman who makes boxes on a full-time basis. After 15 years as a social worker, Charlotte Mrani decided to put her passion for craftsmanship first. “I have always had many ideas and a love for craftsmanship,” Mrani explains. “My mother was an artist and my father came from a carpenter family.” After completing an education in cabinet making and design, and working as an apprentice for a fine-box maker in Ireland, she found her niche. “I fell in love with the technique immediately. I would make boxes over and over again until I was satisfied with the result,” Mrani recalls. 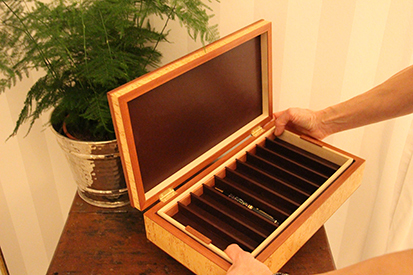 Her first boxes where humidors – well-sealed boxes for cigars. “I couldn’t see any Scandinavian alternatives for humidors so I started crafting them from Scandinavian wood,” Mrani says. She quickly moved on to making other kinds of fine boxes, all with beautiful wood and burr as a starting point. The creation of the pattern, marquetry, cutting, gluing, fitting and puzzling are each carried out in designated parts of Mrani’s workshop. “Each step requires precision,” Mrani says, adding that her main inspiration comes from the wood itself: “I will choose the most beautiful part and take it from there.” As well as making boxes for different exhibitions, Mrani works with a diverse network of customers. Watchmakers, a client who arranges cigar championships and a Swiss diamond-ring vendor are a few examples. Her boxes can also be found at Harrods in London, thanks to her collaboration with the British brand Linley. Going forward, Mrani wants to bring attention to the art of fine-box making as much as she can. “It is wonderful when people show interest. I can talk about this for hours,” she laughs.